As I write this, I am halfway across the North Sea on my way to Norway on board the P&O Cruise Ship Azura. A holiday, perhaps? 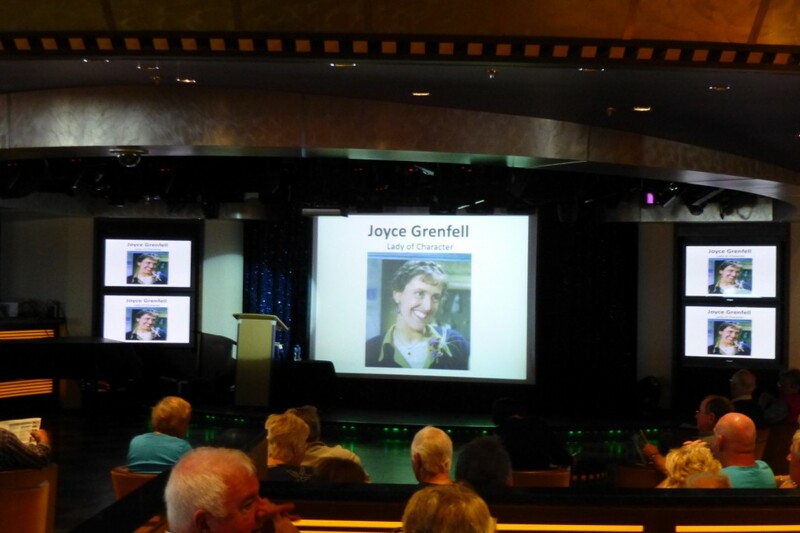 Well, not really, although I do intend to enjoy the Fjords – 5 hours ago I was performing as the guest speaker in front of 300 passengers and in return for that 45 minute talk and another in five says time, Stewart and I get a free cruise and paid as well. I thought you might like to know how this came about, as some of you might like to apply yourselves. I saw the possibilities while listening to other peoples’ talks on various ships over the years. I have seen talks on Concorde, Jazz, Finance, Art History, Famous Murderers and lots more. Having thought ‘I can do that’ I sent off for an application form. I was called to audition in October 2012 and spent a day at Carnival Cruises headquarters in Southampton. Seven of us had been chosen from several hundred applications received that year and we were required to give a shortened presentation (20 minutes) on one of our topics and then we were given a tour and information about how the contracts worked. The potential speakers had very varied subjects from Ian Fleming to Shergar, Bridge Construction to Security Systems, but all were very interesting. Styles of delivery also varied but enthusiasm was very evident. My subjects are all literary or theatrical characters with this mornings’ being ‘Joyce Grenfell’ and Fridays’ being ‘Laughter is the Best Medicine’ looking at Pam Ayers, Victoria Wood, Willy Russell and others. So would this interest you? Do you have several stories to tell about your life or business? Would you like the opportunity to travel while entertaining an audience? Why not contact any cruise line and see if they are taking applications and good luck. See you on the high seas! On a related subject, because I intend to do more of these ‘speaking’ cruises, I will not have so much time to promote my open courses so after eight years they are being mothballed. So for your last chance to join me for ‘Being Loud & Clear’ at only £45 for this half-day workshop click HERE. Get out onto that BUSINESS STAGE to be NOTICED and REMEMBERED. SPEAK your way success at Loud & Clear voice coaching.